I love a good maxi dress. Especially when I'm able to layer a lightweight sweater over one and not look bulky. I scored this ikat print dress at Forever 21 a couple of weeks ago and quickly fell in love with it (sadly it's sold out online). The length, the material and colors are all perfect, but on its own it's kind of shapeless. I decided to pair it with a basic black sweater for some structure, and accessorized with white sandals and my favorite summer tote. I hope everyone had a great weekend! 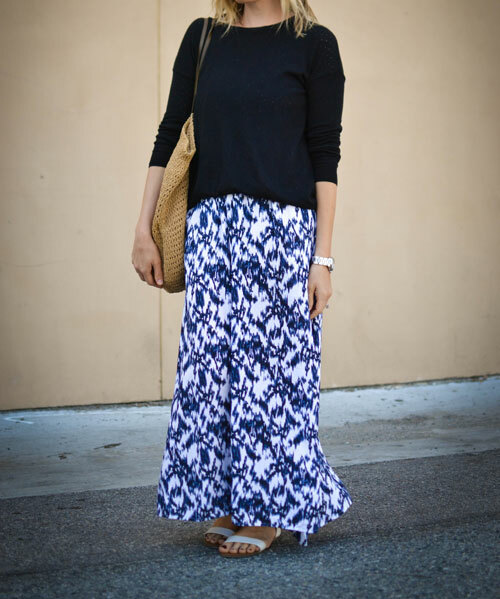 Great maxi, love the print!